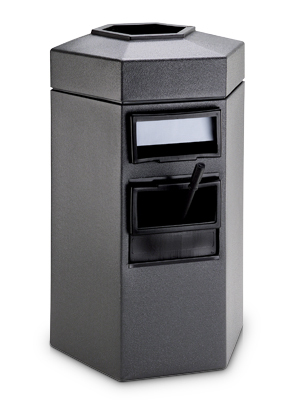 The Bermuda 1 gas station receptacle features a towel dispenser and water bucket with squeegee to provide and ideal windshield service solution for high traffic areas. The lift-off lid for easy trash removal includes a patented Grab Bag™ system to secure the trash bag in place. Hexagonal lid opening measures 9-1/2". The standard towel dispenser accommodates 1 or 2-ply folded paper towels, suggested towel size is 10" x 10". Interior Splash Guard protects the towels from trash. The water bucket is removable and holds up to 2 gallons of water. The black receptacle is made from 50% post consumer recycled (PCR) material, and the charcoal unit is 25% PCR. All models are shipped in a carton made from 50% recycled content.